The frat mom from the University of Oklahoma’s now-banned Sigma Alpha Epsilon fraternity is upset and “heartbroken” after she was portrayed as a racist for a video that surfaced of her chanting the n-word, the Daily Mail reports. 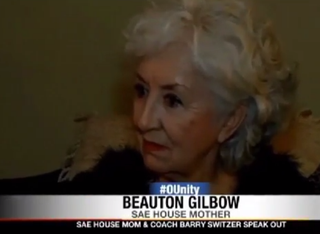 The video from Vine, which was posted in February 2013, shows Beauton Gilbow, 79, laughing and singing at a party and repeatedly chanting the offensive slur. However, according to Gilbow, she was just singing a song—Trinidad James’ “All Gold Everything”—even though, as the Daily Mail notes, at no point in the actual song is the word used seven times in a row. University President David Boren acted swiftly and, along with banning the frat, expelled two of the students who allegedly led the chant. With the closure of the frat, Gilbow was out of a job—along with Howard Dixon, the frat’s black chef—and campaigns to raise money for both of them were launched. Dixon’s campaign had collected almost $60,000 as of 12:30 p.m. EDT, well over the $50,000 goal. A similar fund started for Gilbow disappeared around the time the Vine video started going viral.